I grew up in California, in the San Francisco area. Over the course of the first twenty-five years of my life we experienced a major drought and some other moderate droughts, too. If you have ever lived in an area where water scarcity is a concern, your role as a groundskeeper or sports turf manager becomes heavily scrutinized in a hurry. “Why on earth are you watering dirt?!!! !” Believe me, I heard that loudly a number of times in my teens and early twenties, when I was tending to fields or working as a baseball coach in California. 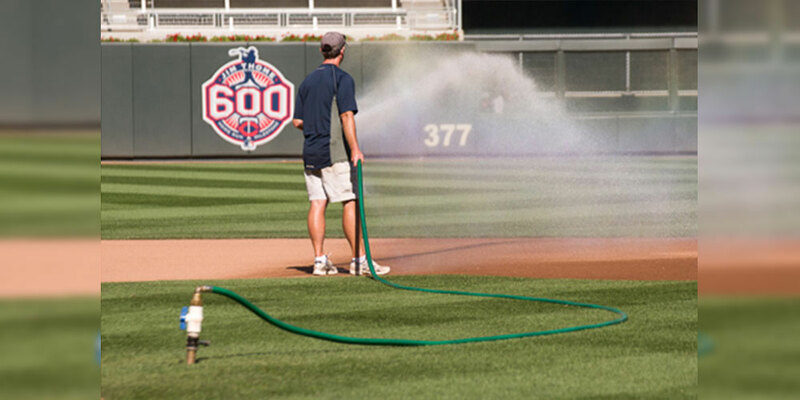 To the novice, the notion of watering around home plate, on the baselines and the infield dirt is about dust control. 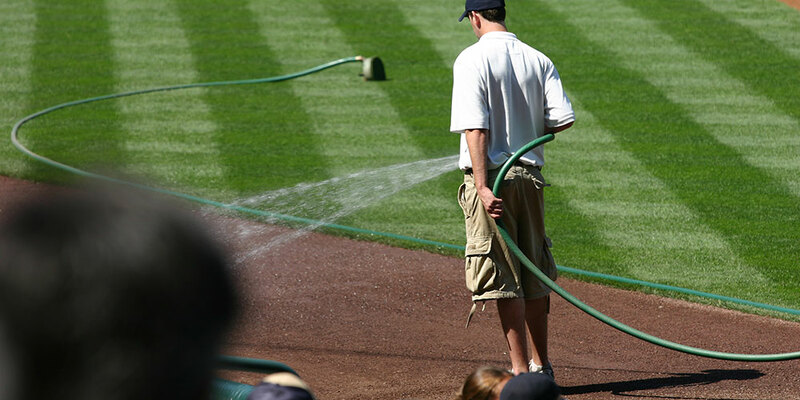 To the grounds manager on a baseball field, watering dirt is about ensuring that the entire soil profile players hit, pitch, run and field on has sufficient moisture not just on the surface, but through the surface. If you remember anything at all from this article, please retain this: the most important time for you to improve playability on your infield is not by watering the dirt before the game — it is the water you apply six, twelve, eighteen hours or more before the game. That is when you have the opportunity to thoroughly water the soil profile of the infield skin and saturate the dirt, while still allowing time for the top quarter to half-inch to air out and be firm enough and ready for quality play. Somewhere along the way growing up, I knew to a degree that deep moisture on infields was a good thing. However, it was not until the 2002 season, when I went to work for the Los Angeles Dodgers as Eric Hansen’s assistant that I really began to appreciate the benefits of deep watering on infield skin areas. Southern California is certainly not the toughest place to grow grass, but maintaining a quality infield skin there is a unique challenge. The lack of significant rainfall, coupled with the strong sun during the baseball season, meant the quality of the infield skin falls squarely on the lap of the groundskeeper. I spent four seasons working for Eric, and my time there led me to strongly believe that a key to quality infield skin was never letting it completely dry out. While our maintenance activities on the turf always meant there would be a day or two after a home stand when the skin area would not get heavily watered, I still made a point of trying not let it totally crack under the baking sun. There were many hours I spent watering the infield dirt at Dodger Stadium late in the day, while the team was out of town… wonderful and quiet times in an empty ballpark. I found that starting a home stand was much smoother for us if the skin areas had been receiving thorough and deep water in the days leading up to our games. I am not a soil scientist or someone who looks to quantify everything, but I am writing this based on years of experience and observation. How the infield skin looks at the surface to your eye is just one part of the equation. Whatever your infield dirt profile depth happens to be, ensuring that the dirt is moist all the way through that profile is a critical part of your success as a groundskeeper. Adequate moisture through the skin will act to reduce the hardness of the soil profile and lead to truer bounces and improved playability of the surface. I find it very interesting that the golf industry has really embraced the use of handheld soil moisture meters for turfgrass. If you are new to your field or have multiple fields, perhaps one of these devices can be beneficial to you in keeping track of your infield skin moisture. My personal situation is unique in that for the past twenty-two years I have always gone to work at a ballpark, and had only one field to keep an eye on. During the season I am there so much that between my eyes and a rain gauge I have an idea of where my infield skin moisture is. For those of you running complexes, or skipping around town to various parks within your area, tracking moisture content is certainly a huge challenge. If you have time to water infield skin areas heavily by hand, you have an opportunity to do great things. If you do not, consider the use of automated irrigation for infield skin areas. If this is an option for you, be sure to use high-speed heads that turn in double the time of a standard turf irrigation head. Those will be less of a problem in windy conditions. Beacon Athletics has a fine selection of nozzles for you to consider for watering your field. When I water turfgrass, I generally prefer to get as much flow as I possibly can for interval watering. Syringing or cooling is a different consideration. When we water our dirt areas in Minneapolis, the area and weather situation will dictate the type of nozzle we use. 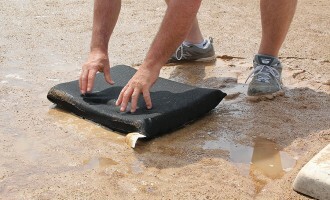 For instance, watering batter’s boxes and the mound requires a finer mist that is easily controlled at your fingertips. Watering baselines means we like to have a nozzle that has a horizontal flow rather than conical, so that we water the dirt of the baselines but not the grass. Infield skin watering requires different nozzle considerations depending on time of day, weather conditions, and proximity to game time. The pre-game watering should just be a touch up, to ensure consistency. Hopefully in the hours leading up to the game you have adequately watered the skin, so that pre-game is not a time to play catch up on water distribution. What about the weather? If you did not know, the National Weather Service in your area is required to provide some type of Aviation Forecast under their Forecast Discussion tab every six hours. They also update an Hourly Weather Forecast in graph form quite regularly throughout the day. Between those two options, you can get a great picture of what your day can and will be like. In terms of your infield skin, you must look well beyond the chance of rain and potential amounts of rainfall. In addition to rainfall, the amount of sky cover, wind and dew points all play a big part in infield skin maintenance. Just over a week ago, I had a very interesting scenario going into a noon game. Reading the hourly weather graph the previous afternoon, I saw that in spite of cloud cover, the wind would be out of the North and the air was dry and cool. We went into game time at noon the next day with air temperatures in the mid 40’s, winds from the North at 5-10 mph, full cloud cover and a dew point of 22*F. I felt the field played really well that day, mainly because at 5 pm the previous afternoon I watered the infield skin really heavy to the point where there was standing water. I knew from the forecast that the dry overnight air would lead to a firm surface the next morning while the water slowly percolated down through the dirt profile. Certainly an odd situation for April 5 in Minnesota, but just an example of knowing what air and sky conditions can mean to a playing surface. We here at Beacon Athletics want you to find a way to get out and water your dirt… and we want you to enjoy it! I have one more experience that I would like to share. During my four seasons working for the Dodgers, we rarely played day games on any day but Sunday. My job now in Minnesota is a different story, as we move game times around quite a bit depending on the time of year or day of the week. I recall that during warm and sunny Sundays in Los Angeles, we had the potential of really drying out on the skin during the last few innings of those Sunday day games. In spite of that, we found that the ball would still bounce well on the skin — this is, if we had kept up all week with deep post-game soakings of the dirt after night games. The Friday night watering of the dirt at 11 pm was critical for Sunday’s playability. Knowing that post-game Saturday night would not be as heavy a watering going into a day game, we really pushed to apply a lot of water on Friday night. So we were considering weather and game times thirty-six or so hours in advance. It definitely mattered. 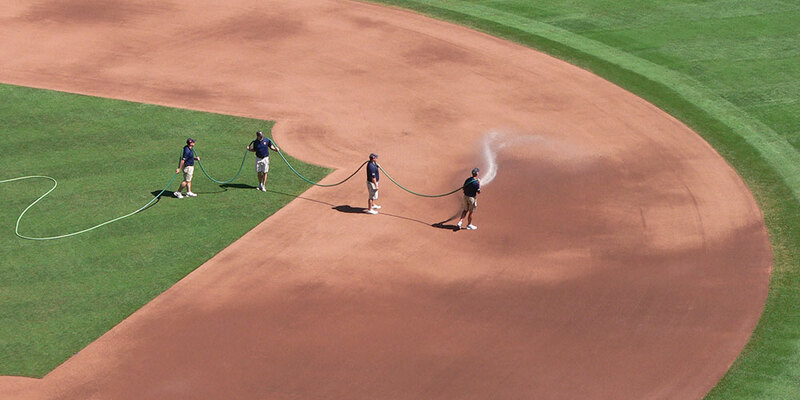 Just a few more thoughts: Short of absolutely flooding the infield dirt to the point of runoff, there is a technique to daily watering of infield skin areas. 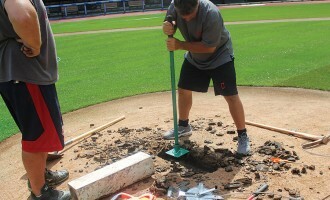 Even if you roto till your infield in the offseason, once your season gets going, areas where the players’ cleats work in calcined clay will hold more moisture than other areas. For instance, where runners lead off 2nd base tends to hold more water, as do the spots where the shortstop and 2nd baseman creep in to play at double play depth. The areas where the 1st baseman and 3rd baseman play back tend to hold more moisture as well. About three to four feet off all the edges will be firmer than other areas in the body of the infield dirt. This is partly due to your nail drag not working those spots in different directions, and also due to calcined clay not being worked in as much by cleats. So what is the point? Observe your dirt and water more thoroughly in the spots that dry out quicker. Think of the foul lines going past 1st and 3rd base. The first few feet inside the lines on the skin has a tendency to get real hard if you don’t really focus on putting water there. Water less in the spots that hold more moisture, like lead off areas and where infielders spend more time. 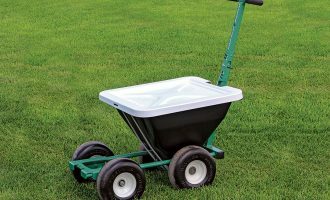 If you have a low spot or two, remember to water around the low spot, not in it, as water will find a way to get there until you are able to address the grade. Most of all, just try and enjoy the onset of spring and the chance to be outside working on your fields, knowing that your fine efforts make will make kids of all ages very happy.